After the Ant Hill School is destroyed, a little boy ant is afraid to go back to school. 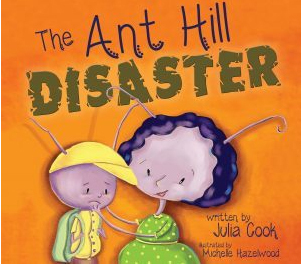 The Ant Hill Disaster thoughtfully addresses fears associated with both natural and human-caused disasters. It models effective parenting and teaching responses. This book can help assure children that through love, empathetic understanding, preparation, and effective communication, they can stand strong, even in the midst of uncontrollable events.